Install your HTML email signature in no time! Follow our step-by-step guides to install your email signature in Zoho CRM. 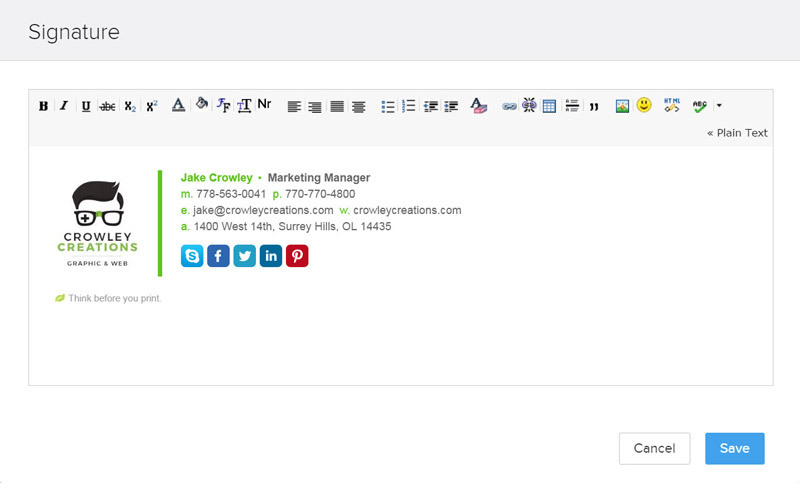 It's never been easier to create a new email signature for Zoho CRM. Check out our beautiful email signature templates and easy to manage email signature software, that makes creating email signatures for Zoho CRM a breeze. Login to your Zoho CRM account. Ensure you have your HTML email signature file or the signature files HTML code available. Follow our Step-by-Step Guide below for full instructions on installing your email signature within Zoho CRM. If you run into any issues during your HTML email signature installation in Zoho CRM, please see the Troubleshooting FAQ for frequently asked questions, before contacting support through your member account. Open your HTML email signature file in Notepad if running Windows, or Text Edit if running macOS. Press Ctrl + A to Select All, followed by Ctrl + C to Copy the code. If running macOS, using the Cmd key instead of Ctrl. Switch to your web browser and Zoho CRM account, then from the top right of your screen, click on your Tools icon and select Setup. On your Setup page you should see a number of links. Under the General heading you want to select Personal Settings. You will see your signature field below. Click on the Edit icon to the right which will allow you to insert your signature. A toolbar will appear at the top of the signature box. 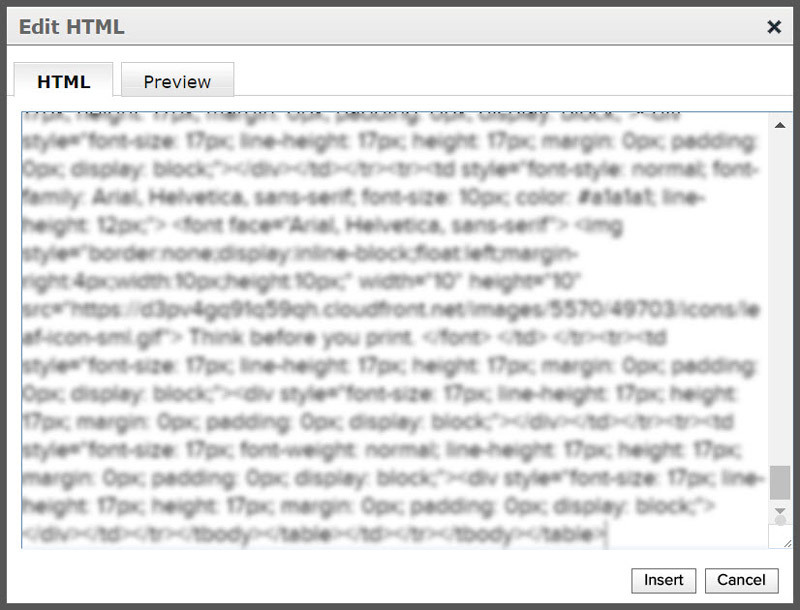 Click on the HTML icon to the far right, then paste your copied signature code into the window that opens and hit Insert. You will see your signature appear, all you need to do now is save your changes below. Congratulations! Your email signature is now installed and ready to use! If you have tried our Step-by-Step Guide for installing your email signature in Zoho CRM and you run into any issues, please read through this troubleshooting guide before contacting Support for further help. Experiencing an issue? Let us know! We aren't currently aware of any issues with installation in Zoho CRM. 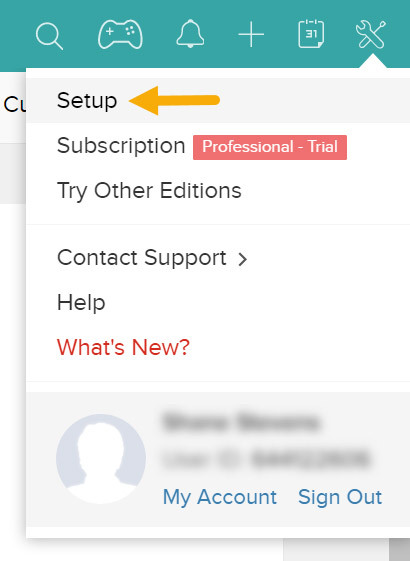 If you experience an issues, please get in touch with our Member Support Team through your Email Signature Rescue account using the red help button. Troubleshooting: Where do I find my email signature HTML code? If you are an Email Signature Rescue member and are logged into your account, you can access your signature code by selecting the Copy Code button next to your email signature on your Dashboard. If you have been emailed your HTML file, open the file in Notepad or TextEdit. If you have your HTML file saved on your computer hard drive, navigate to where you have saved the HTML file and open with Notepad or TextEdit.